Fabulous and large antique drop necklace in very finely worked silver, with large blue chalcedony carved round beads on a fine chain with tiny very detailed silver flowers, and with a large blue chalcedony drop drilled and invisibly suspended from a flower form mounting. Circa 1910. Spring ring clasp. The metal is not marked but tests positive for at least 800 silver. Similar necklaces are pictured in "Warman's Jewelry" by Christie Romero. The color of the stone is a bit brighter and a bit more green (although still blue) than the pictures show. 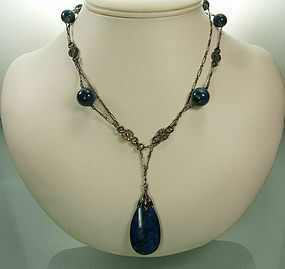 Shown doubled on the necklace form, it also can be worn as a long sautoir. The wearable length is 34 inches. The largest round beads are 13 mm in diameter. The drop is 2 1/4 inches long and 3/4 inch wide. Excellent condition. Photos enlarged to show detail. Display form is life size.